These examples are neither best practices, nor recommendations to follow. Use them to better understand where your business is now in terms of a disciplined strategy execution approach and what can be improved. 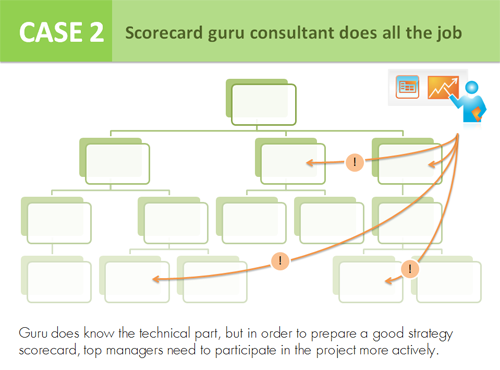 In the majority of cases the declared goal of the scorecard project is more efficient and effective strategy execution. 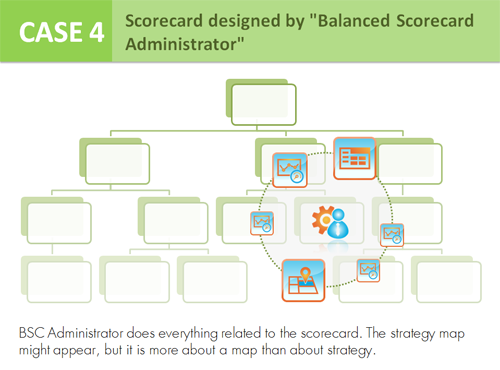 Many organizations call this project a “Balanced Scorecard,” but in most cases those scorecards have little to do with the Kaplan & Norton Balanced Scorecard. To stay on safe ground, one could use “Strategy” or “Business” scorecard terms. I describe some typical cases below; as always, I invite all business professionals to share their own examples in the comments. If you are looking for more theory on cascading, then check out this article. Strategy execution and strategic agility is not necessary about building some sort of scorecard. There are successful companies where employees have an excellent understanding of their role in the company’s strategy execution. In those companies the discussion around strategy is some kind of natural daily routine and they do well without any formal approach to the strategy. 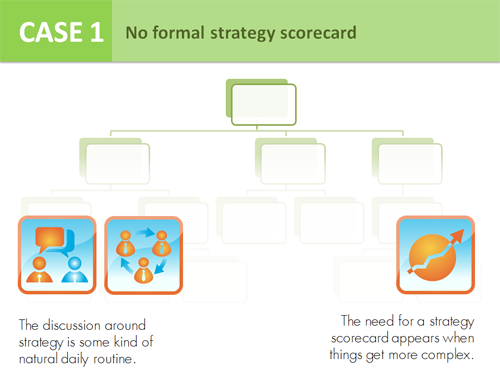 The need for a strategy scorecard appears when things get more complex. I was lucky not to have to work with such cases myself, but I know they exist. The key role in the project is played by an external expert who creates the scorecard; the scorecard is then delivered in the form of many interconnected indicators. It is not a surprise that this project is disconnected from a company’s strategy, and doesn’t help with the strategy execution. Very soon, top managers understand that a scorecard guru does know something about the technical part, but in order to prepare a good strategy scorecard, they need to participate in the project more actively. The variation of the “guru” case. 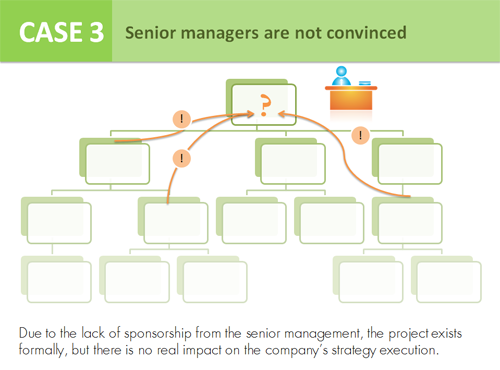 The scorecard might be developed by some external consultant or someone from the company, but due to the lack of sponsorship from the senior management, the project is stillborn. Formally, the scorecard exists, and probably the KPIs are updated once a year, but there is no real impact on the company’s strategy execution. This is one of the most popular starting points. A role of “BSC Administrator” appears in the company. This person is supposed to do everything related to the scorecard: normally a focus is on the KPIs and data input. The strategy map might appear as a result of such a project, but it will be more about a map than about strategy. This approach could work for some time, but if nothing is changed the project will end up as another basic KPI dashboard. This is an improved version of the “BSC Administrator” case. 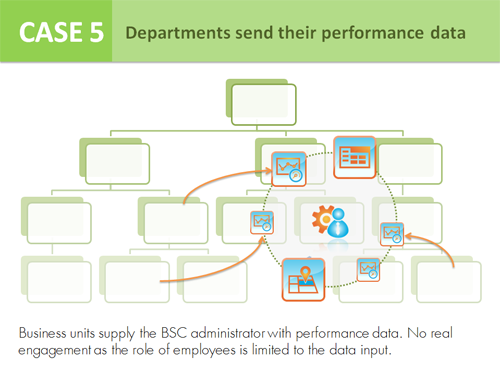 Business units start supplying the BSC administrator with performance data. The top managers try to “translate” their strategic ideas in some way. This model normally lacks engagement from the side of the employees as their role is limited to the input of the performance data. The participation of the senior managers is based on the top-to-bottom approach. The ideas are translated to the lower levels in some way, but no real feedback comes from the departments. A slight improvement of the previous case is done by adding “view-only” users from various departments. They do not necessary spend their time entering performance data, but they use the scorecard software to check out their part of the scorecard project. In the best case scenario this approach can be used for the reporting by using the scorecard, but there is no real discussion around a strategy yet. 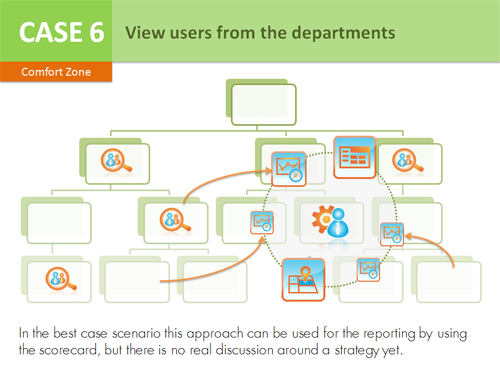 This case is a comfort zone for many organizations: things are moving, reports are generated regularly, some nice strategy maps and dashboards give a sense of the ongoing process… Unfortunately, in such cases we’ll not see an improvement in understanding and commitment to the organization’s strategy. This case represents a typical “improvement” attempt. 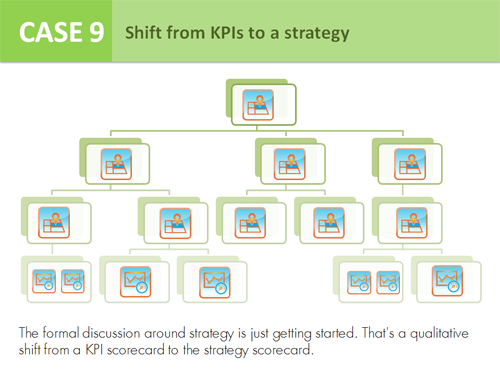 Managers are trying to take a control over the strategy scorecard by focusing on KPIs. Many “index” and “aggregated” indicators appear on the scorecard. Management starts dividing high level indicators into the smaller ones assigned to the business units. This type of cascading works well in the rare cases when business units are just smaller clones of the main core business. Another variation of the exaggerated focus on the KPIs is accountability bias. An organization makes a focus on the performance indicators assigned to the persons responsible for the task. Managers control the processes exclusively by the KPIs. This might work as a solution for some operational challenges, but has little to do with a strategy. Companies that do too much of this KPI-powered “carrot and stick” model will soon find out that their employees are trying to game the system in some way. Management understands that “BSC administrator” cannot be responsible for formulating strategy and business goals. The formal discussion around strategy is just getting started. That’s a qualitative shift from a KPI scorecard to the strategy scorecard. 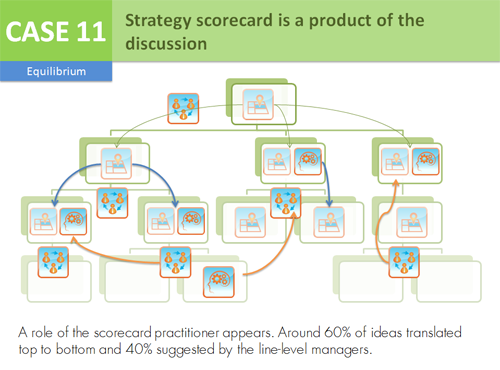 The discussion’s nature starts dominating over the whole strategy scorecard project. 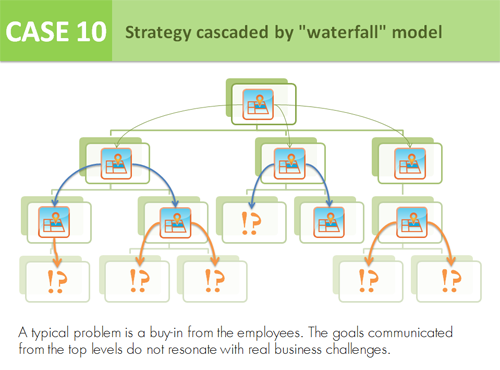 But in most cases the strategy is cascaded by a “waterfall” model from top to bottom. A typical problem at this stage is a buy-in from the employees. The goals and KPIs communicated from the top levels do not resonate with real business challenges and are not accepted by line-level managers. After a certain cultural shift, employees of the company start seeing how they can contribute to the overall success. In most business units a role of the scorecard practitioner appears. This person is ready to fight for a certain piece of the strategy. A strategy becomes a product of a disciplined discussion. The flow of ideas finds its equilibrium with about 60% of ideas translated from top to bottom and 40% suggested by the line-level managers. The indicator part of the scorecard is becoming much more lightweight. A variation of the previous case. An organization realizes the benefit of the proper cascading process. 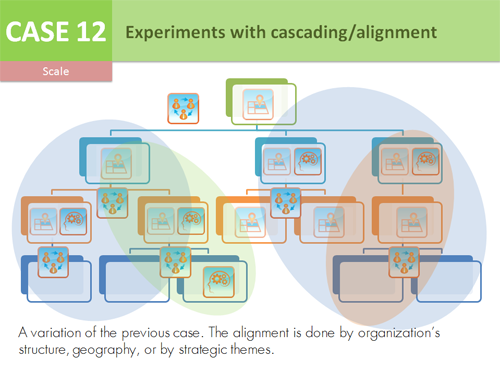 The change is often noticed on the level of terminology as well: senior management understands the limits of the top-to-bottom nature of “cascading” and uses the “alignment” term instead. The alignment is done according to the organization’s structure, geography, or by strategic themes. I am not speaking in favor of any case, as there is no “one size fits all” solution. Any organization needs to find a balance between the benefits of the disciplined strategy execution approach and the new bureaucratic routines that it implies. 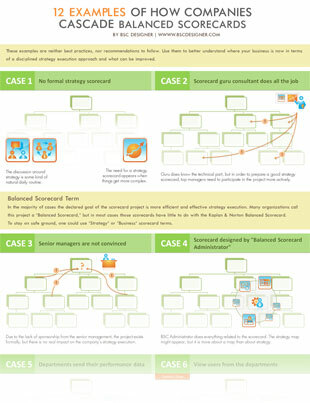 Do you know any more typical cases of the business scorecard implementation? Feel free to share them in the comments.